Meeting on July 9th: At Bridge Church location. 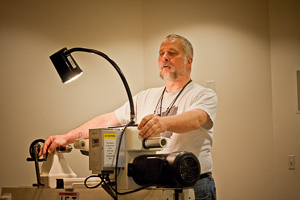 Agenda: A discussion by Barry Uden - lathe tool angle sharpening, tool grinding and finish cuts. The challenge for June is any recently (in the past 6 months) turned object. Demo by Mark Gardner in early November. Details to follow. 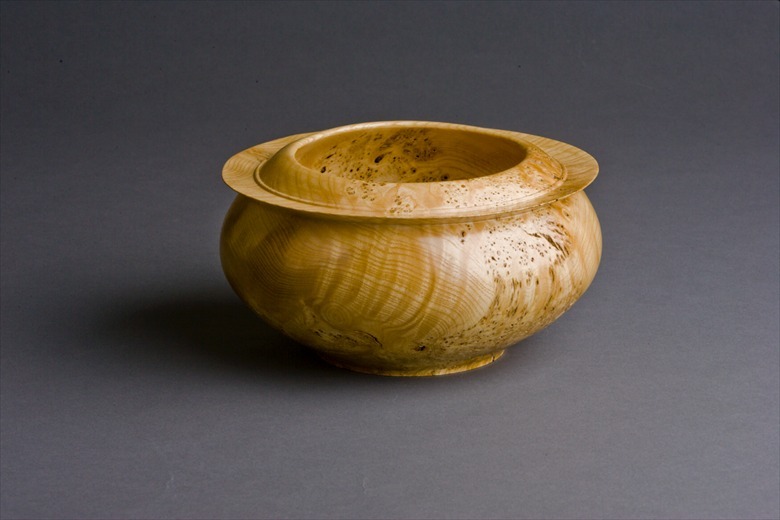 Hollow forms without hollowing, surface embellishment, and square bowl turning with multi-axis. Ellsworth Demo in Q1 2014 being finalized. Off center and textured turning. The main agenda item was Shop Safety, presented by George Chisholm (Woodcraft teacher). 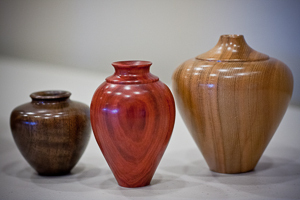 George gave a complete overview for safety in the shop in doing woodturning. He covered such things as the disadvantage of bolting down a lathe to making sure you turn down the speed of the lathe when you finish. In other words, good habits and much margin for error. Revisiting the question of what one can safely wear while operating a lathe was a good set of reminders to anyone. One I had not heard yet: on the startup of grinders, which if cracked can come flying apart, so always stand to the side while starting. The Presidents' Challenge was a piece with your best finish and/or the worst and indicate why. Harvey brought a piece with French polish (boiled shellac (Zinsser) alcohol and equal part Linseed oil) which is good for small pieces that Harvey is so well known for. 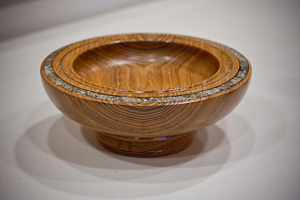 Claude showed a salad bowl finished piece. John had a piece with 6 coats of wipe-on-poly. Mike showed a Tung oil piece that had 4K grit sanding followed by the complete Beal wax process followed by a coat or Renaissance wax. George Lutz was up next to talk about his difficulties in replicating Bill Johnston's process. 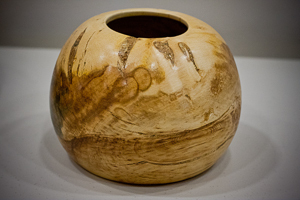 Mike showed a Tigre Kaspy wood piece. 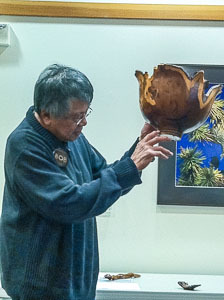 Show-and-Tell: Claude showed a bowl that had a stone inlay ring in it. 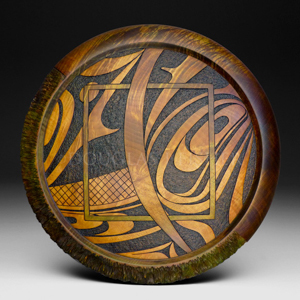 Mike showed a piece that had copper wire inlaid as horizontal rings. He found that silver wire can turn out to be just silver coated copper wire, which after turning is just copper. Tom showed a segmented piece with segments as staids, maple and walnut. 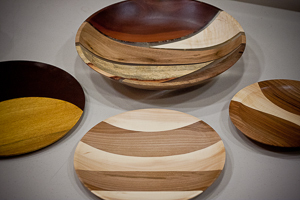 Tom Haines showed a variety of platters and bowls with curved arcs of differing woods. August is the BBQ at Jim's where chain saw safety is the topic. Come at 4. October will be the competition. CA glue is available, and Jim has Anchorseal at $15 a bottle. The club clothes were sold out. Finances look strong. Paid your dues? Better do it. Is now $35 with late fee. Remember, the most dangerous item in the shop is you.